Band on the Wall presents a special edition of Free Vibes, curated with Amazing Radio’s new music champion Shell Zenner. We’ve teamed up with Shell to bring you five of the most exciting artists you need to know. 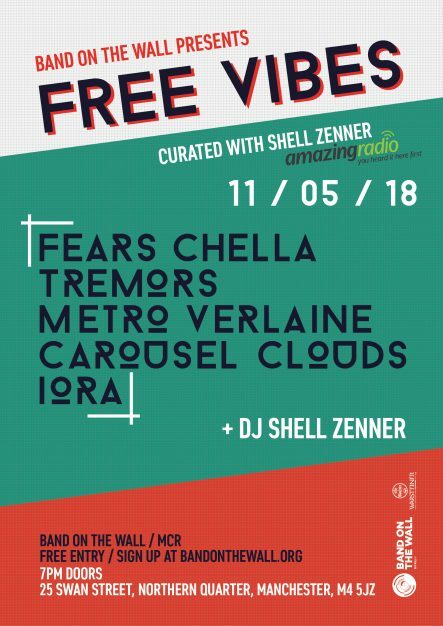 Sign up for free entry and discover new music from the likes of Fears Chella, Tremors, Metro Verlaine, Carousel Clouds and Iora. DJ Shell Zenner will keep the vibes flowing ‘til late! Fears Chella are an indie-pop/grunge four-piece who recently dropped their killer new single ‘Polaroid’. Tremors are a Manchester based five-piece playing a unique blend of shoegaze, alternative rock and americana. Metro Verlaine are a French quartet who deliver an ‘electric and romantic’ sound. Salford’s Carousel Clouds keep their brand of shoegaze firmly rooted in psych and their debut album ‘Tales of Coincidence’ just landed on Ranch Records. Iora is a Manchester-based electronic-folk artist who employ trip-hop and acoustic elements.